Fairtrade. Naturally sourced. Reduce calories. Suitable for vegetarians and vegans. 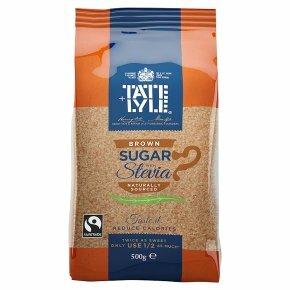 Kosher - KLBD.Twice as sweet only use 1/2 as much* *Demerara Sugar with Stevia is made from the natural extract of the stevia plant. 1 tea spoon provides you approximately the same sweetness as 2 tea spoons of sugar. So whether you're baking, stirring or sprinkling, you can halve your normal serving without halving the taste. This means 50% fewer calories. Isn't that sweet? Got your baking hat on? If you want more boost in your batch or kick in your cake, sprinkle in a bit more than just half.